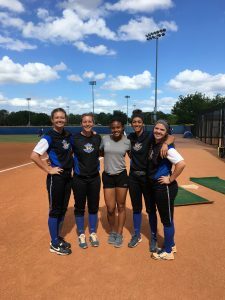 The Rollins Softball team came away from their last home games of the season with a series victory against Lynn University. Rollins traveled to Lynn last season and swept them, making this series personal for the Fighting Knights. Although they are ranked as the sixth best hitting team in the Sunshine State Conference (SSC), they failed to out-hit the Tars. The first two games of the series took place on Thursday, April 13, and the night ended with a doubleheader split between the two teams. Lynn took the win in game one, allowing three runs in the first inning off Chandler Middlebrook’s ’18 three-run homerun, but the Tars just could not get ahead after that. Lynn slowly chipped away at the score with singles and strong baserunning, and the game ended 5 to 3. After a tough loss in the first game, Rollins returned with a vengeance, using the disappointment to propel them forward, refusing to give up until the last out. Again, the Tars got on board first after Hailee Keisling ’17 scored off Sarah Harrison’s ’20 bunt. Amanda Guglietta ’20, the starting pitcher for the game, managed to hold Lynn until they finally caught pace. Sarah Piening ’20 came in as relief to hold the Fighting Knights to just two runs in the inning. Up until the last inning, the Tars continued to fight. Entering the bottom of the seventh, Rollins was down 2 to 5. Keisling manufactured a base hit, followed by juniors Middlebrooke and Brianne Lint ’18 walking to load the bases. As Amanda Guglietta stepped up to the plate, there were two outs, and Rollins was still losing by three—a situation no freshman wants to willingly encounter. However, the Miami native remained calm and collected. After Lynn’s pitcher threw two strikes on Guglietta, she fouled off pitch after pitch, just waiting for the perfect one until it finally came. Guglietta struck the ball and the crowd stood, silent, hoping the hit would be enough to give the Tars a win. The ball sank over the centerfield fence and the team went wild—the freshman just hit a grand slam to give her team the victory. After an exciting Thursday night, the Tars returned Friday afternoon with more than just the plan to win the series. Being the last home game of the season, it was time to honor the five seniors on the team: Chelsea Reed, Hailee Keisling, Claire Hamilton, Hali Marshall, and Rachel Minier. 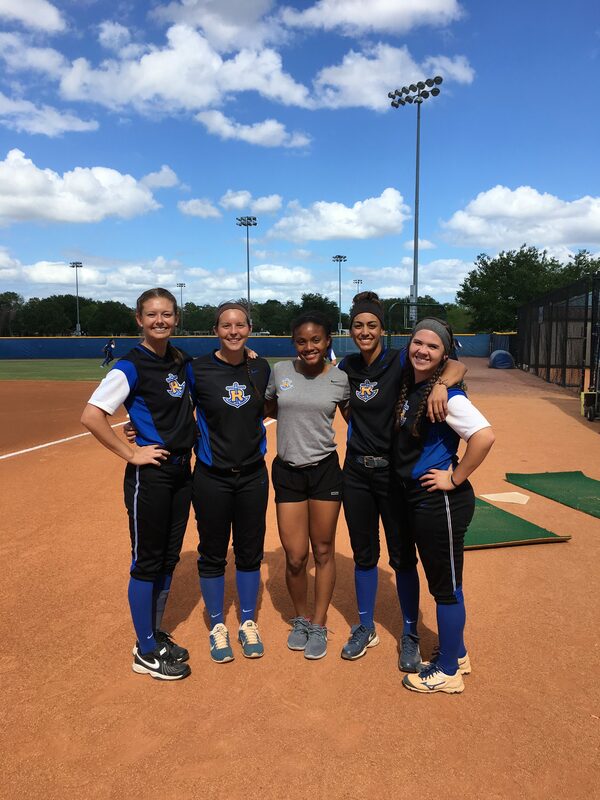 Reed, Keisling, Marshall, and Hamilton are all four-year seniors, with Minier joining the Tars this year as a transfer from conference rival Nova Southeastern. The heart and love for the game all seniors exemplified through their careers is something indescribable, making this last home game particularly special for them all. Luckily, the Tars came away with a 13 to 5 victory, run ruling Lynn in just six innings. Lynn scored the first four runs, but after Thursday night’s game they should know not to sleep on the Tars. Rollins consistently manufactured runs, and sophomore Grace Street’s ’19 pitching a spectacular offense helped tremendously. Street went 3 for 4 on the day, with two doubles, a homerun, and 8 RBIs overall. Entering this game, Lynn had only allowed four homeruns all year. Rollins hit 5 in just three games. This is the first time in program history Lynn has been run-ruled by Rollins, with the overall meeting record moving to 49 to 17. Rollins prepares to finish their season in the upcoming weeks and awaits ranking for regional playoffs.